Transparency Market Research (TMR) has published a new report titled, “Global Microscopy Devices Market - Global Industry Analysis, Size, Share, Growth, Trends, and Forecast, 2017–2025”. According to the report, the global microscopy devices market was valued at US$ 6,000 Mn in 2016 and is projected to expand at a CAGR of 8% from 2017 to 2025. The report suggests that rise in demand for advanced microscopy devices due to increase in chronic and acute disease diagnosis, surge in pharmaceutical and biotechnological researches, and drug discovery operations are expected to fuel the growth of the global microscopy devices market from 2017 to 2025. The global microscopy devices market is growing at a rapid pace owing to emerging new and advanced technologies and rise in demand for pharmaceutical and cell biology research. Increase in development of new integrated microscopes and surge in demand for microscopes in the fast-growing life sciences industry are the other factors driving the global market. 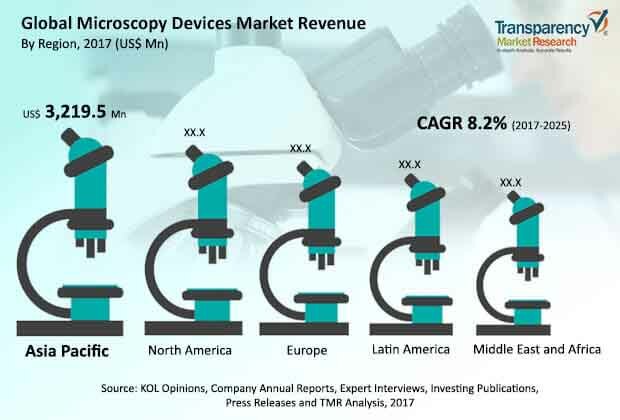 However, high cost of microscopes and low budget for R&D in the life science industry are the major restraints of the global microscopy devices market. Asia Pacific and North America are projected to dominate the global microscopy devices market in the next few years owing to increase in manufacturer focus for business expansion in these regions. Players are developing advanced microscopy devices for research operations and entering into distribution agreements to strengthen their presence in Asia Pacific and North America. Rise in adoption of technologically advanced products manufactured by local manufacturers, such as Optomic, is likely to drive the microscopy devices market in Europe. The market in Europe is expected to expand at a CAGR of 8% from 2017 to 2025. The report offers detailed segmentation of the global microscopy devices market based on product type, application, and end-user. In terms of product type, the market has been classified into optical microscopy, scanning probe microscopy, electron microscopy, and microscopy accessories. The optical microscopy segment is poised to account for the leading share of the global market during the forecast period from 2017 to 2025. Factors attributed to the higher share of the segment include increase in demand for different types of optical microscopes and low cost of stereo and phase contrast microscopes. The scanning probe microscopy segment is likely to register comparatively higher growth rate in terms of revenue during the forecast period owing to continuous innovations in the product technologies by major players. The cell and molecular biology segment is projected to account for significant share of the global microscopy devices market during the forecast period. The neuroscience segment is likely to expand at a high CAGR from 2017 to 2025. Dominance of the segment is attributed to increased research activities in neuroscience, benefits of using microscopes in the field, and wide product portfolio of major as well as local manufacturers. In August 2017, Thermo Fisher Scientific launched an advanced electron microscopy device, Cryo-EM, which enables scientists to examine samples at low temperature. Continuous new product launches and exponentially rise in patient base in developed as well as developing countries are likely to propel the segment between 2017 and 2025. The pharmacology and toxicology segment is projected to expand at a CAGR of 8% during the forecast period. The clinical pathology and diagnostics and surgery segments accounted for combined market share of 25.0% of the global microscopy devices market in terms of revenue in 2016. In terms of revenue, Asia Pacific was the leading market for microscopy devices in 2016. High growth in the pharmaceutical industry, increase in R&D expenditure, and high adoption of electron and scanning probe microscopes in countries such as China, Japan, and India contribute to the high share of the region. However, high cost of advanced microscopes, and significant customs duty and excise tax are likely to hamper the market in Asia Pacific. Increased research spending in the life science and pharmaceutical industries in countries such as the U.K. and France fuels the growth of the microscopy devices market in Europe. Economic recovery in markets in Latin America such as Brazil is augmenting health care and research expenditure driven by rise in private health insurance, entry of international drug manufacturers, and health care providers. This is likely to propel the microscopy devices market in Latin America at a CAGR of 7% from 2017 to 2025. The report also provides profiles of leading players operating in the global microscopy devices market. Olympus Corporation, Hitachi High-Technologies Corporation, Carl Zeiss Microscopy GmbH, and Nikon Corporation, among others are the major players operating in the market. Expansion of microscopy devices product portfolio through partnerships to improve efficacy, accuracy, and quality of microscope is a growing trend in the global microscopy devices market. For instance, on January 2018, Thermo Fisher Scientific completed the acquisition of Phenom-World, a Netherlands-based electron microscopy manufacturing company. In February 2018, SemiConductor Devices (SCD), a manufacturer of cooled and uncooled infrared detectors, announced the acquisition of Quantum Imaging. Other prominent players in the global microscopy devices market include Shimadzu Corporation, Leica Microsystems, Bruker Corporation, FEI Company, JOEL Ltd., and Cameca SAS.